We're the UVA Library's community lab for the practice of experimental scholarship in all fields, informed by digital humanities, spatial technologies, & cultural heritage thinking. We offer mentoring, collaboration, & a safe space for anyone curious about learning to push disciplinary & methodological boundaries through new approaches. We're foremost a space for learning together—about anything—by trying stuff. Think of us as friends and colleagues who can help you teach yourself new ways of approaching your interests. We'd love you to be part of our community! What is the Scholars' Lab? How do you fit into the UVA Library? What does Scholars' Lab do? How can you fit into my work? Can you build me a thing? Can we collaborate on something? We're part of the Library's mission to provide equitable access to learning to everyone, and we're proud that librarian superpowers are part of our toolkit! Visit our Library collaborations hub to find out about the many ways we co-create with and depend on our amazing Library colleagues, or jump to the UVA Library's main website. Curious? Please get in touch with us—absolutely no prior experience or fully formed ideas needed! Email us at ScholarsLab@Virginia.edu with questions, or if you already know you want to meet with us. Sign up for our newsletter to hear about events and opportunities! Where: Scholars' Lab's discussion area just inside our Common Room. Come chat with our experts about anything, from your getting started through advanced projects. One of our primary missions is supporting the work of emerging scholars and practitioners—particularly UVa graduate students and folks interested in digital humanities and spatial technologies. 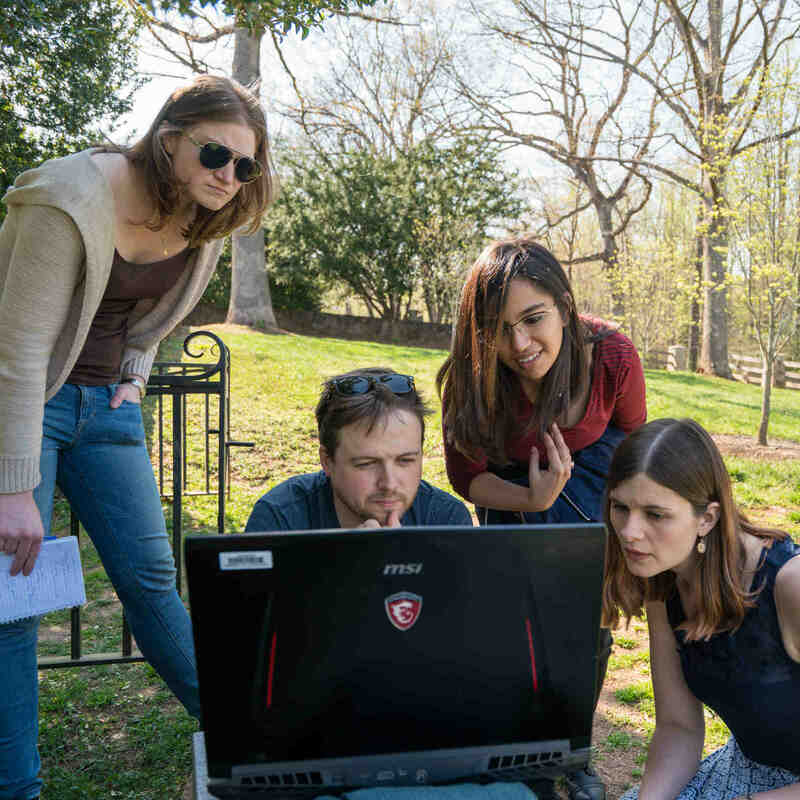 We offer a variety of fellowships and opportunities to this end, which collectively aim to support graduate students during the full measure of their time at UVA. From the innovative Praxis Program to professionalization training for students on the DH job market, we're here to help whether you're looking to answer a specific call for applications or simply looking to discuss your research. We are staffed most weekdays during the semester and summer sessions. We are closed for University holidays. See our full hours calendar for actual hours on any given day. The Scholars’ Lab Makerspace is a place for tinkering and experimentation with technologies like desktop fabrication, physical computing, and augmented reality. Open to everyone, we specialize in applications and research questions in the humanities and arts. Find things like 3-D printing, wearable technologies, physical computing, & more at our space in the middle of the Scholars' Lab Common Area. Experts at thinking about space + time. We've got experts in GIS, cultural heritage informatics, augmented reality, virtual reality, 3D modeling, photogrammetry and scanning, aerial footage, and other spatial approaches (including our own Neatline project for telling stories that combine timelines and maps).